• tabbed monthly pages (on two pages)- The overall month-at-a-glace is a perfect size for me. It's large enough to write down and highlight the main tasks, birthdays, appointments, or reminders for that day. • a dated page per day- Here I list all the things I need to do for that particular day and check them off as I go. There are a total of 22 lines on each page, so that's plenty for me to work with. And each page has an empty box on the bottom to write in whatever other miscellaneous things come to mind. I use it particularly for blog post ideas, dinner plans, gym classes, and whatever else I feel that isn't as important to list within my task list but things I'd still like to make a mental note of or remember. • notes pages- I like how this page is tucked in right before each new upcoming month. Here I just recap my month and events, and then I jot down any upcoming goals I have for the next 30 days. I also use this page to keep track of any outgoing mail/postcards that need to be sent out, my workout progress, and my "wish-list." While I wouldn't go as far to say that this notebook is my overall "perfect" planner and accommodates all of my scheduling/planning needs, I will say that it's been pretty helpful thus far in keeping my tasks a lot more simplified and making me really focus on what's important for each day or month. 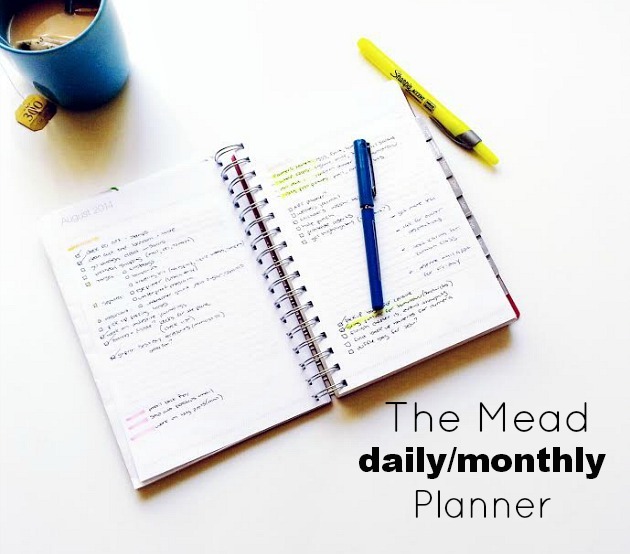 What are you using as your go-to daily planner? And does it work well for all of your scheduling needs? Do let me know as I love seeing how others use different forms and styles of planners! If you have a post on it, feel free to leave your link below! Sounds like a perfect one! I wouldn't say it's the "perfect" one, but it's one that works for my main tasks. I am committed to the Moleskin ... the weekly one. I looked into those and thought about trying one out! I use a custom insert for my midori that is adopted from the daily docket from the art of simple. It's working so far, but I agree, the pages not falling flat isn't convenient. As long as it works for you, that's all that matters. Being that it doesn't fall completely flat isn't all that bad, but when I have a billion things to jot down, it would be nice to have the paper on the hard surface for me to work with. I hope you're enjoying your Midori still. It looks great!